The ANC charged a ‘racist’ DA councillor for removing illegal posters, while the councillor charged the ANC spokesperson with assault GBH, among others. 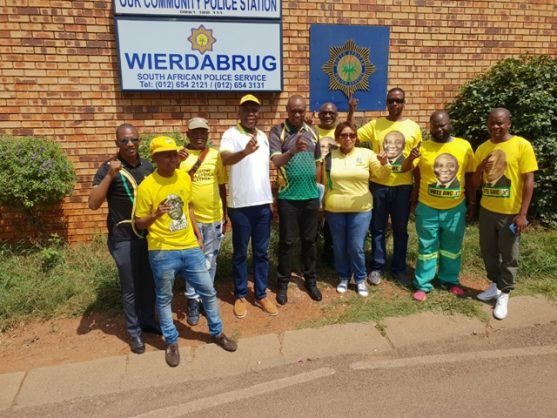 Leaders of the regional African National Congress (ANC) in Tshwane were at the Weirdabrug Police Station in Centurion on Wednesday to lay criminal charges against Democratic Alliance (DA) councillor Kingsley Wakelin, accusing him of racism and breaching the Electoral Act by removing posters of other political parties. “We’re here to formally lay criminal charges against Councillor Wakelin. He was was confronted by the ANC Youth League [Tshwane] chairperson Lesego Makhubela while he was seen removing posters of political parties on poles. The posters were of political parties contesting the elections,” ANC Tshwane regional chairperson Kgosi Maepa said outside the station. The ANC in Tshwane insists that Wakelin is a “racist”, adding that he also removing posters of “black business people” in the Centurion area. “Today [Wednesday] Tshwane MMC Economic Development Ridge Peterson, DA Tshwane Deputy Chief Whip Cllr Crezane Bosch and the DA Tshwane Ward 48 Councillor Kingsley Wakelin have opened a criminal case against ANC Tshwane Caucus Spokesperson Lesego Makhubela at the Weirdabrug Police Station in Centurion,” said Bosch in the statement. “The ANC Tshwane caucus spokesperson Lesego Makhubela attempted to assault Cllr Wakelin for removing illegal posters alleging that he is removing ANC election posters. Cllr Wakelin also contacted the Tshwane Metro Police for assistance,” said Bosch. “The Councillor [Wakelin], just like any other resident, has the right to apply for permission to remove illegal advertisements. There are many illegal advertisements that obstruct road signs, traffic lights and the DA cannot be intimidated by the ANC and allow lawlessness to flourish in our suburbs.